Sports - The Fan's Take: Baseball Singled Out? First, let me state my favorite sport is baseball, with football being a close second, so this may come across as bias thinking, but baseball is not the only sport using PEDS, HGH, and IGF-1 (Deer Antler Spray). I have no facts backing my previous statement, just common sense thinking. Baseball is portrayed in sport media as the only sport that has athletes try to cheat the system and cheat to get an advantage against their opponents. It is understandable that baseball will get most of the scrutiny on this topic, because baseball started this monster . This is why football, should thank baseball for being the villain on this topic, now they can fly under the radar and not get scrutinized for ban substance use. I can feel the wheels turning in your head, just another baseball fan hating the popularity of football or how dare I lump football in such a topic, well, lets look at a couple examples. Example #1: When an article came out from Sports Illustrated that Ray Lewis used deer spray [IGF-1 (Insulin-like Growth Factor-1], which is on the ban substances list in the NFL, to speed up his torn tricep injury, it was pretty much a none story. Yes, a a couple days some reporters questioned Ray Lewis about the topic, but Ray denied the story and that was that. Replace Ray Lewis's name with Baseball Player X, do you think it would be swept under the rug? Example #2 (this is just a ponder thought there is no fact behind this example): Eight months removed from a surgery to repair a torn anterior cruciate ligament in his right knee, Minnesota Vikings running back Adrian Peterson embarked on an unlikely historical season, falling 9 yards shy of Eric Dickerson's NFL single-season rushing record. After some research, a standard ACL rehab/recovery takes from 7-9 months, so in 8 months Adrian Peterson went from surgery to MVP. 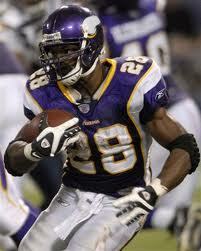 Replace Adrian Peterson name with Baseball Player X, do you think the miraculous recovery would be swept under the rug? I am not excusing baseball for putting a blind eye on the usage of ban substances, I am asking that sport media and sport fans keep your eyes on all sports. One thing we all have found in the past few weeks is that the ungoing usage of ban substances is still alive and well and players of all sports will always be one step ahead of testing. One last thought for all of the football fans, such as myself: For the safety of the game, please learn a lesson from baseball keep both eyes open.